Driver card for use toghether with MGP panel decoder and Signal decoder. This driver card handle 12 standard LED. LEDs are connected directly to the card (without any resistors - brightness is controlled from the decoder). Can be used to drive e.g. railroad signals like e.g. the Swedish signals from JECO. Signals should have common + (common anode) and any resistor shall be removed. Several driver cards can be connected to the same decoder in serial. 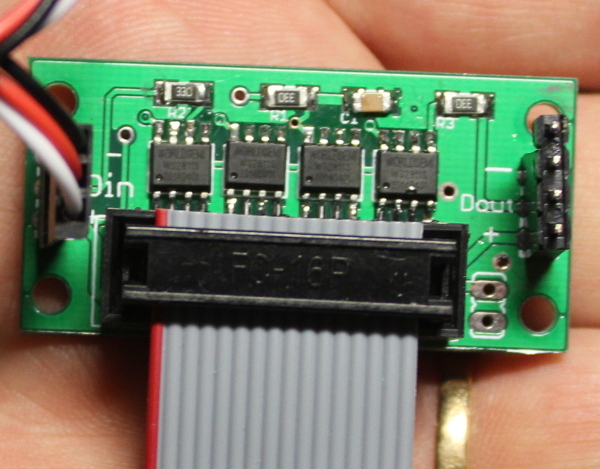 The driver card is connected to the decoder with a standard servo extension cable (not supplied). LEDs are connected with a ribbon cable ( 50cm supplied with the card). The card can be delivered as a bare card without any connection. Choose "bare card" if this options is required. For more information see instruction LED-card.